Caesars Entertainment Corp. broke ground this week on their new $375 million conference center as Caesars tries to compete for the city’s lucrative growing convention business. The 550,000-square-foot Caesars Forum Convention Center is being built behind the LINQ, Harrah’s and Flamingo and will connect with them via walkways. 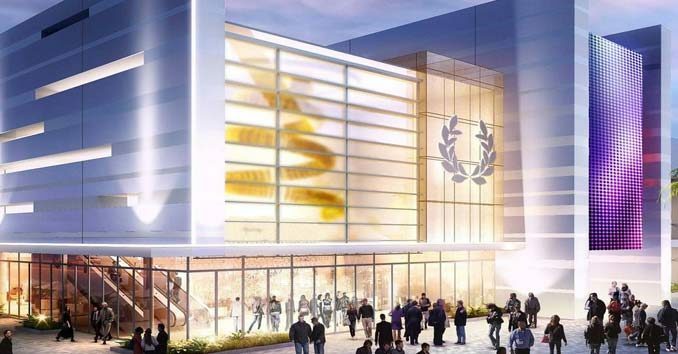 Caesars Forum is expected to be completed in 2020 and will feature 300,000 square feet of sellable meeting space and a 100,000-square-foot outdoor plaza for receptions or break space. “Consistent with our post restructuring plans, Caesars Forum is the first installment of our growth strategy for the benefit of Las Vegas and our employees which will also help meet the increasing demand for group business meetings of all sizes,” said Mark Frissora, President and CEO of Caesars Entertainment. As part of a series of transactions with VICI Properties, Caesars Entertainment recently announced its intention to acquire 18.4 acres of land as part of its plans to develop this new conference center. Caesars Entertainment has already booked $70 million in convention business, including one of the largest shows in the country the NSSF Shot Show. SHOT Show, the world’s largest Shooting Sports Convention, has been held every January at the Sands Convention Center since 2010. The show is slated to continue at the Sands Convention Center until 2027 but is set to expand to the new Caesars Forum in 2021. Current Convention Space is Running Out! According to a January report by Morgan Stanley, Las Vegas Convention Space is at peak utilization rates of about 75 percent. In fact, the number of convention attendees traveling to Las Vegas has risen nearly 50 percent since 2010, leaving Casino operators rushing to expand their convention spaces. Wynn Las Vegas this year started construction on a 400,000-square-foot convention center. In February, MGM completed a 200,000-square-foot meeting space expansion at the Aria. They are also building a 250,000-square-foot convention space at the MGM Grand that is expected to open in 2020. The latest in technology and design.